Product prices and availability are accurate as of 2019-04-21 06:05:48 EDT and are subject to change. Any price and availability information displayed on http://www.amazon.com/ at the time of purchase will apply to the purchase of this product. 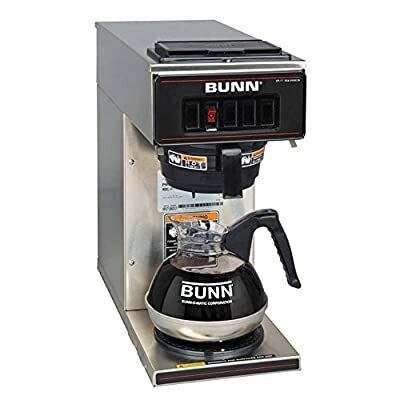 Brewing up 3.9 gallons per hour, the BUNN VP17-1 SS Pourover Coffee Brewer with One Warmer - Stainless Steel will have you sipping your favorite cup of Joe in no time. Complete with warmer, this brewer keeps your coffee at just the right temperature. It's made from stainless steel so you know it's here to stay. About Bunn-O-Matic Corporation Founded in 1957, Bunn-O-Matic Corporation introduced the first paper coffee filter and, in 1963, the ''pourover'' coffee brewer for commercial users. BUNN Home Brewers are made to do exactly what famous BUNN Commercial Brewers do: produce great tasting coffee, quickly, simply and consistently. Today BUNN continues to design and manufacture innovations in commercial beverage equipment and home coffee brewers from its headquarters in Springfield, Illinois. Silver-finished stainless steel coffee brewer. Brews 3.9 gal. of coffee per hour. Comes with a warmer. Splashguard funnel for protection from hot coffee. Dimensions: 25.3L x 12.9W x 28.8H in..
Silver-finished stainless steel coffee brewer Brews 3.9 gal. of coffee per hour Comes with a warmer Splashguard funnel for protection from hot coffee Dimensions: 25.3L x 12.9W x 28.8H in.